Have you ever felt that there is no life without APT? 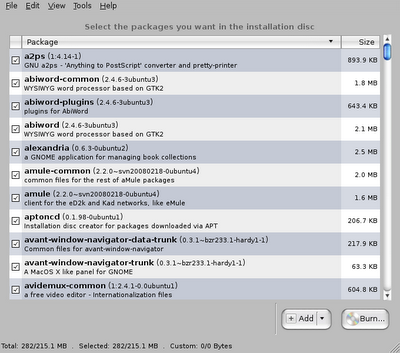 Well, if you’d suddenly lost conection to the internet, how would you install new packages? What about dependencies? You’ve just finished installing Ubuntu and configured it to a rad look, with all your favorite applications? For some reason you now have to re-install it? Feel like you have to download all of your favorite programs again? What? You’ve already forgotten which packages you had dowloaded before? Backup: Backup all downloaded packages (via apt-get, aptitude and synaptic) to restore later. Transport: Take with you all your favorite packages, in a removable repository where you can install then all on anytime, anytime. Download: Get an entire repository, or a specifc section. Simply point-and-click, and in few time you’ll have an CD(s) or DVD(s) with entire main, restricted, universe, multiverse, contrib, etc. Share: Share your packages with your friends without Internet conection. Also, send a meta-package for him to install the same set of packages that you have. Now to create ISO of packages presently availble on your system press “Create” button or to “Restore” from already created ISO/CD/DVD press “Restore” button . When you click on “Create” button it shows all the packages available which could be used to create the local repository ISO . You can remove packages from the list or add more from alternate locations in this list. After you have finalized packages with which you want to create local repository ISO clicking on the “Burn” button takes you to window where you finally chose what kind of media you would like to burn these files onto CD/DVD and location where to store this ISO created. Once CD/DVD/ISO is created packages from it can be easily installed by clicking on the “Restore” button of the APTonCD . “Restore” basically copies files from CD/DVD back to APT cache so that when you install any package using apt-get/aptitude they can be installed quickly without having to download those packages from the internet.